Islamic Jihad terrorist dies of his wounds, bringing total death count to seventeen. A seventeenth Gazan died on Monday after he was shot on Friday during the violent protests in Gaza. Of the previous sixteen Gazans who died, at least ten were confirmed terrorists, and five were part of Hamas' military wing. Monday's casualty, 29-year-old Faris al-Raqib, 29, was shot east of Khan Yunis in southern Gaza, Gaza's Health Ministry. In a statement, the Islamic Jihad terror group Raquib was a member but claimed he was not carrying a weapon when he was shot. as well as an attempted shooting attack against soldiers along the border. On Sunday, Hamas leader Yahya Sinwar threatened Israel that, "The unemployed who do not have work in Gaza have found work at your borders - to burn your equipment and shoot you from a distance." 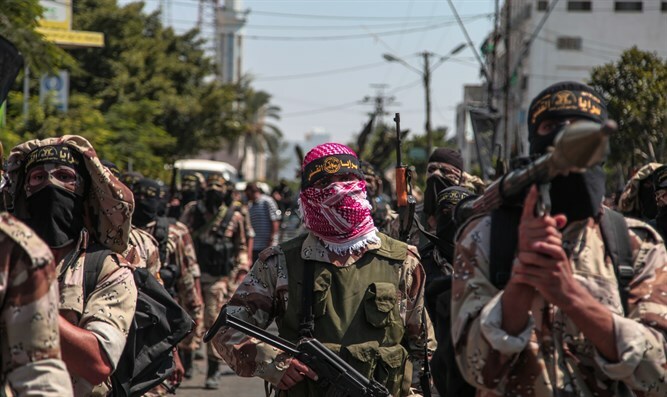 Hamas repeatedly chooses to invest millions in terror infrastructure, instead of in sanitary conditions, education, health care, and employment for Gazan citizens. Sinwar also said that the Gaza riots "will continue and will not stop until we open the borders at the right time... There is no peace with the enemy and that no experience or plan will make us decide to make peace with him."